“Vorsprung durch Technik” doesn’t translate to “know your place, human,” but in the case of the 2019 Audi A8 it probably should. Fourth generation of the luxury sedan, it’s the most technologically advanced, gadget-packed iteration to-date, paving the way for Audi’s autonomous driving future among a host of other “firsts”. While the new A8 won’t find its way to US shores until fall 2018, Audi invited us to get an early preview – I just didn’t expect to have a crisis of identity while I was there. It’s a more striking car than its predecessor, from the bold “Singleframe” grille at the front, through the more sculpted crease-lines on the hood and sides, to the muscular emphasis above the wheel arches and the rear with its distinctive lighting. I suspect it’ll age more gracefully than many of its competitors. Audi has both standard and long-wheelbase versions, though the US will only get the latter: just 10-percent of sales of the old A8 were of the short-wheelbase model. Sadly the dramatic lighting on the car you see here won’t make it to American shores. Blame archaic regulations for the absence of laser headlamps up front, and the more dramatic OLED lighting at the rear. Audi puts the latter to great use, with sweeping animations that the automaker claims makes turn signals and such more readily recognized, but the US rule-makers don’t think you’re ready for them. Audi will keep it easy for the US, with a single engine option at launch that’ll also help the car escape the automaker’s fairly confusing new badging nomenclature. The A8L will come with a 3.0-liter V6 TFSI, with 340 HP and 369 lb-ft. of torque, and a top speed of 155 mph. It’s paired with a sweet- and smooth-shifting 8-speed automatic transmission, and 0-62 mph comes in 5.7 seconds. It’s a so-called “mild hybrid” engine, which means Audi adds a 10 Ah battery and a belt alternator starter, but that the electrification never actually supplies motive force to the car. Instead, the A8 uses it for some clever coasting: between around 34 and 99 mph, for instance, the car can shut the engine down completely and glide with no fuel consumption, then start the engine up again near-instantaneously. Engine stop-start now works at up to 13.7 mph, rather than when you’re just waiting at the lights. It’s the quietest, most surreptitious implementation of such a system I’ve ever experienced; most of the time, I didn’t even realize it had kicked in. The economy gains from the mild hybrid system aren’t going to win the A8L any green awards, nor probably challenge the diesel version that Audi has no plans to launch in the US. Rather, it’s all about the smoothness of the experience. The combination of the silken eight-speed, permanent quattro all-wheel drive, and the purring V6 make for an unruffled car on the road. Speak to Audi’s suspension engineers, though, and you find they have even more ambitious things in mind. Traditionally, the A8 has found itself in the middle of the German luxury sedan space: perceived as not quite as sporting as BMW’s 7 Series, yet not quite as sybaritic as Mercedes-Benz’s S-Class. Audi wants to change that perception, and it wants to have its cake and eat it too. It’ll do that with Audi AI active suspension. As standard, the A8 will come with air suspension, with four layers of height adjust and the automaker’s familiar drive select modes for dynamic, comfort, eco, and other on-road styles. Audi decided the best place for me to test them were the winding hill roads outside of Valencia, Spain, and sure enough the A8L did a surprising job of keeping its poise in tight cornering in dynamic mode on the one hand, then wafting over potholes and ridges in comfort mode on the other. Clever, then, but not as clever as the electromechanical suspension system. Powered by the 48V system, it can individually control actuators on each of the wheels, for even more precise and rapid adjustments to the car’s dynamics. When combined with a new, forward-facing laser scanner, the A8 will be able to actively look ahead to upcoming road conditions and preemptively adjust its ride height and suspension settings to minimize speed bumps and pothole judder. It’s almost eerie in how well it works. Watch from the outside, and you can see the A8 crank itself up just before it hits a bump: Audi says it can smooth out more than 3-inches of obstacle, leaving only the slightest of shake in the cabin. Brake hard and there’s no nose-dive as you might expect from a big, heavy sedan; even when I made several laps of a roundabout, pushing harder with each orbit, lateral roll was astonishingly absent. Turns that might normally have your passengers leaning against the doors are flat and steady. Throw in the dynamic all-wheel steering option, which allows the rear wheels to turn up to 5-degrees – either with the front, or in the opposite direction, depending on speed – and the A8 becomes positively nimble. The turning circle is noticeably reduced, particularly welcome when you consider the A8L is 17.4 feet long, while lane-changes feel more confident. Indeed, though I’d need to drive them back-to-back to be certain, I suspect the A8 with active suspension is more than enough to take on what Mercedes and BMW are doing right now. If there’s a weakness, it’s that Audi won’t have an S8 at launch to combine those fiendishly clever underpinnings with a performance engine. Though all signs point to one in the pipeline, there’s no telling when an S8 might arrive. Indeed, the V8 and W12 gas engines earmarked for Europe are conspicuously missing any sort of North American roadmap, though Audi at least is making positive noises about the eight-cylinder together with a plug-in hybrid with wireless charging support. It’s not that the 3.0-liter V6 TFSI is a disappointment. 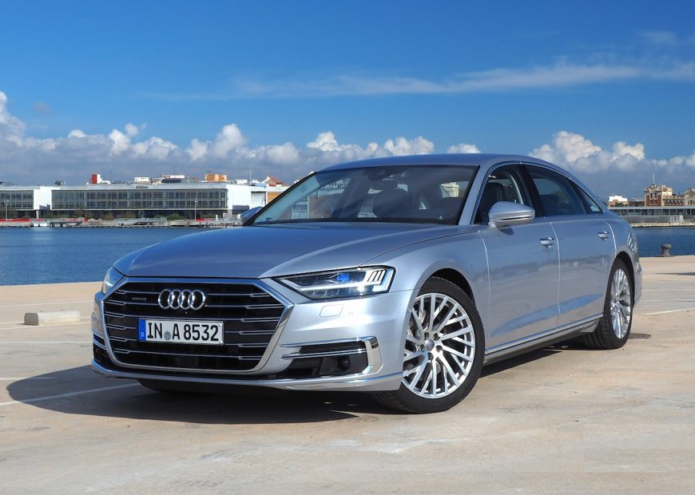 It’s a refined, capable engine that suits the A8’s cruising talents well, with enough pep that overtaking at highway speeds and even a little backroad jaunting were easily within its means. Compared to the beastly Mercedes-AMG S63, though, or BMW’s flight-footed M760i, and Audi’s car is understandably just too restrained by its power shortfall. The active suspension has another trick, though it’s not something you’d want to see in action. As part of the pre sense 360 safety system, if you get t-boned while you’re traveling at speeds up to 37 mph, the A8 can jerk the car up suddenly by maxing out the suspension travel. In a split second, the car lunges 3.15-inches on the side of impact, enough to redirect the crash forces into the more structural components lower in the doors. Somewhat confusingly, Audi is eager to highlight that the new A8 was designed for Level 3 autonomous driving, but it won’t launch with the functionality. The Audi AI traffic jam pilot will be able to take over stop-start driving at speeds up to 37.3 mph, on highways and multi-lane highways as long as they have a physical barrier between you and the opposite direction of traffic. Unlike traditional adaptive cruise control systems, there’ll be no reminders to keep your hands on the wheel. As Vincent found when he tested the system himself, Audi AI traffic jam pilot certainly works. However, it also requires more than just the driver putting their trust in the A8 – it needs regulatory approval, too. It’s that, not the technology, which won’t be ready for the A8’s US debut next year. When it does arrive, it’ll be a cost-option – final US pricing for the A8 hasn’t been decided, though the current model kicks off at $82,500 – and it’s unclear at this stage whether A8 early adopters will be able to retroactively add AI traffic jam pilot support via a software upgrade later on. Fundamentally it’ll demand a more comprehensive sensor suite be fitted, adding the aforementioned laser scanner at the front to the combination of 12 ultrasonic sensors, four 360-degree cameras, mid-range and long-range radar, and regular and infrared cameras that give the A8 its all-round vision. They’re not just for autonomous driving, mind. 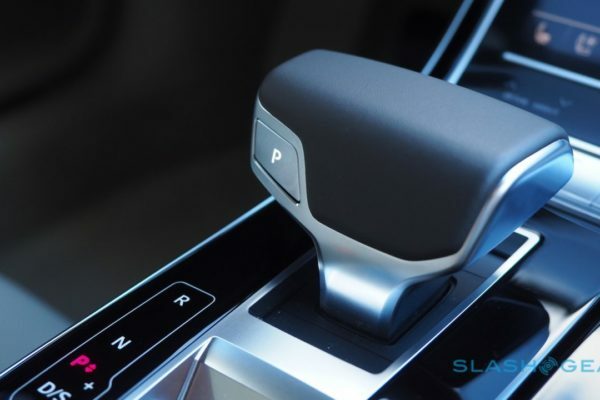 Also under the Audi AI umbrella is remote parking pilot and remote garage pilot, which allow the car to maneuver itself in and out of parallel and perpendicular spaces, or in and out of garages, respectively. As long as the various sensors can see the right gap, and as long as you’ve got your finger on the AI button – either on the dashboard or in the Audi smartphone app – the A8 will trundle its way into the right place, handling the steering, brakes, acceleration, and transmission all by itself. Inside, the cabin has been completely updated. 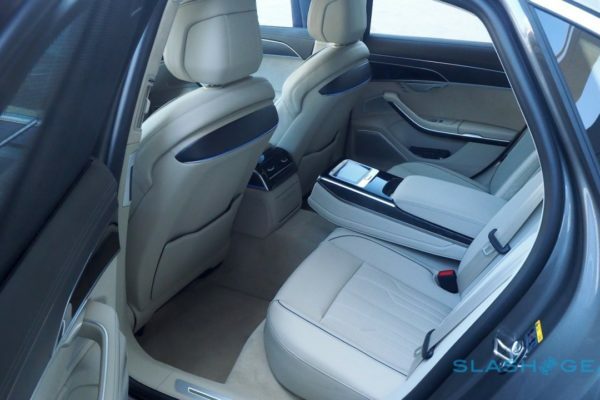 The A8 gets seating for five, the A8L for four courtesy of a full-length center console and armrest. 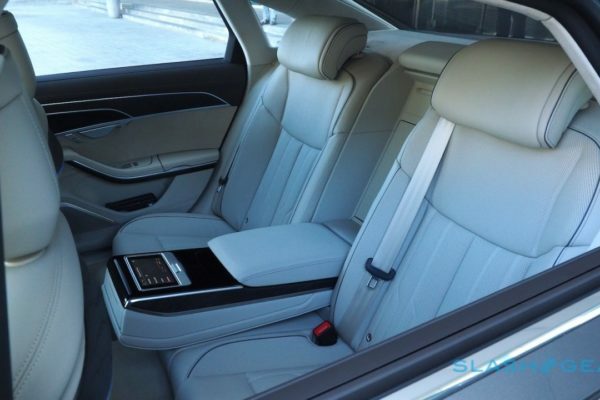 As well as heating, cooling, and massage options, there’s a “relaxation seat” package that adds a foot massager for the rear right seat, four-zone climate control, Audi’s detachable Android-powered tablets mounted behind the headrests, and a Rear Seat Remote. The latter, about the size of a phablet, pops out of the center armrest and can be used to control multimedia, seat and window settings, and even work as a phone handset for the A8’s VoLTE system. Those in front aren’t short on touchscreens, mind. 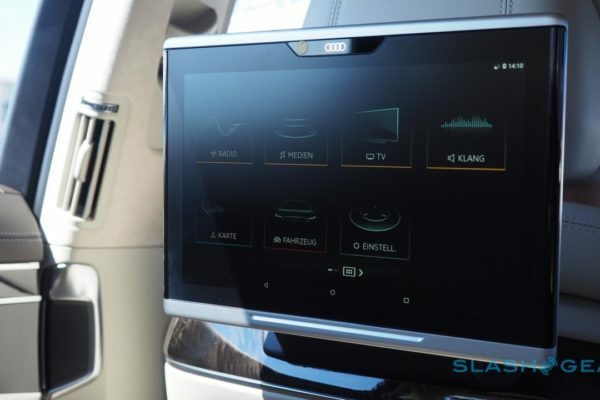 Gone is Audi’s old scroll-wheel system, replaced with MMI touch response: a 10.1-inch touchscreen atop the center console, an 8.6-inch touchscreen below it, and the familiar Virtual Cockpit digital instrumentation in front of the driver (with an optional head-up display above). 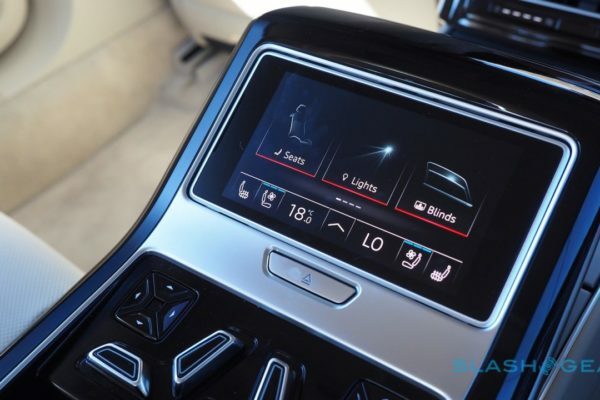 The center top display is responsible for infotainment – it also shows Apple CarPlay or Android Auto – while the panel beneath it is dedicated to the HVAC and comfort controls. Audi’s capacitive touchscreens support haptic feedback, with a mild buzz as you tap each virtual button. Gone is the old handwriting system, which required you to sketch out letters individually atop the MMI touch rotary controller; now, the whole lower touchscreen can show either a QWERTY keyboard or a huge handwriting panel. The latter is, quite frankly, the best example of such an interface that I’ve tried to-date. In addition to its sheer size, it usefully supports both block and cursive text. You can trace individual letters with your fingertip, or whole words, and even when I scrawled across the screen – not even looking at the display – it was able to translate my messy cursive. Audi offers auto-predict and auto-correct alternatives as you type, while a simple swipe from right to left clears out the text box. Alternatively, there’s a new voice recognition system. 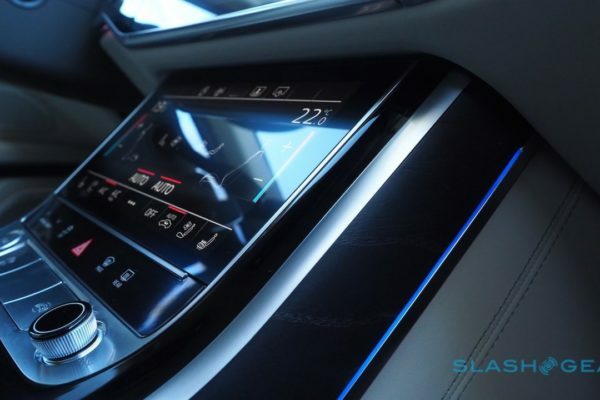 Though the A8 still uses onboard processing, it also has a cloud-based system when the car is connected. That supports natural language and conversational recognition, though personal details aren’t stored in the cloud for privacy reasons. 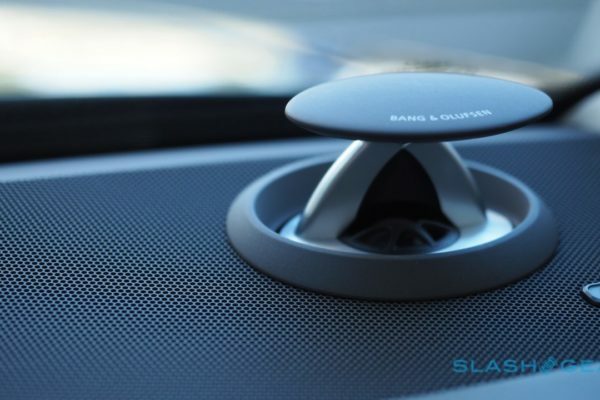 Eventually, I’m told, the goal is to include voice support for other car features, like being able to control the air conditioning. Audi has made good use of the A8’s connectivity. There’s Car-to-X for swarm intelligence, with each LTE-enabled Audi filling its neighbors in on traffic conditions and potential hazards. In 2018, that’ll add parking space location, with cars giving each other a heads-up on where there’s an empty spot. The modem itself now supports LTE Advanced, while the WiFi hotspot can deal with 2.4 and 5 GHz wireless. If there’s a drawback to all this technology and active safety gadgetry, it’s the potential for driver overload. There are a lot of icons, graphics, and messages to absorb, and while you can shut off the center console top touchscreen, I’d love to see a broader “quiet mode” which pared things back to the bare minimum. The good news is that Audi confirmed to me that they’re also looking at how all that information could be made tidier. It’s an issue that affects both the 7 Series and the S-Class, too, both of which have each been cranking up their own tech levels. Of the three cars, I prefer Audi for the look and feel of its infotainment system, but I suspect there’ll be a learning curve involved when first getting behind the wheel. We’re at a fascinating place in high-end vehicles. If the A8 is restrained, it’s by a regulatory framework – or, more accurately, many often-conflicting frameworks – yet to catch up with the technology. Like its peers, Audi could distance the driver even further from the experience of actually driving. That it hasn’t is a matter of policy, not impossibility. The result is an awkward balance of advanced tech making involvement demands of the driver that often feel like they’re simply for show, or to answer this inelegant question of liability. The A8’s parking pilot system can undoubtedly respond faster than human reactions would; its 360-degree sensors have coverage no flesh & blood driver could claim. Yet we still have to hold down the AI button on the dashboard or in the app because, otherwise, who is really in charge? You are the legally-mandated, morally nebulous meat-fuse in the system. Audi knows the car is cleverer than you are; after just a few minutes at the wheel, you yourself know that to be true, too. So much of the technology is designed to stop you from doing dumb, human things. Door handles that pause even as you pull them, should a cyclist be approaching from behind. Sensors that watch out for signs you might be about to curb your beautiful 20-inch alloy wheels. Brakes that automatically stop you if you’re headed for a parking lot ding. At this point in the luxury sedan game, smooth power, supple leather, and gadgets galore are table stakes. Impressive, cosseting, deeply pleasant table stakes, certainly, but nonetheless the bar has been raised. 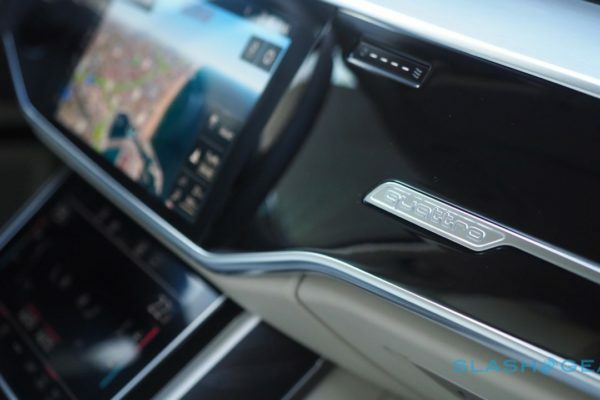 In a world where technology has eclipsed mere mechanical engineering, the 2019 Audi A8 is quite possibly as smart as it gets.